Videos, solutions, examples, and songs to help Grade 2 students learn how to use addition to find the total number of objects arranged in rectangular arrays with up to 5 rows and up to 5 columns; write an equation to express the total as a sum of equal addends. I can use addition to find the total number of objects in an array. I can write an addition equation (e.g., 3 + 3 + 3 = 9) to express the total as a sum of equal addends. I can represent the total number of objects arranged in a rectangular array as an expression with the repeated addition of number of objects in each row (or column). For example if there are 3 rows with 4 objects in each row, I can write the expression 4 + 4 + 4. The following diagram shows that multiplication is repeated addition. Scroll down the page for examples and solutions. An array is a group of objects arranged in rows and columns. We can use arrays to show repeated addition. 1. What two repeated addition number sentences does this array show? 2. Draw two arrays that each show 3+3+3+3. We can use arrays to show multiplication as repeated addition. Write multiplication sentences for this array. The whole numbers multiplied together are called factors. 1. Draw an array for 3 × 5. 2. What is the repeated addition for 3 × 5? 3. What is the product for 3 × 5? Multiplication shows the total number of items in a certain number of groups. Arrays can be used to help solve multiplication problems. 1. There were 3 spiders on the playground. Each spider made 3 webs. How many spider webs in all? 2. There were 4 flowers with 3 bees on each flower. How many bees in all? 3. Isabella went to the park. She saw 2 butterflies on each of the 5 trees. How many butterflies did she see? 4. Liam found 4 ladybugs on each of 4 branches. How many ladybugs did he find in all? Add by the rows and add by the columns. Multiplying with arrays for second grade. 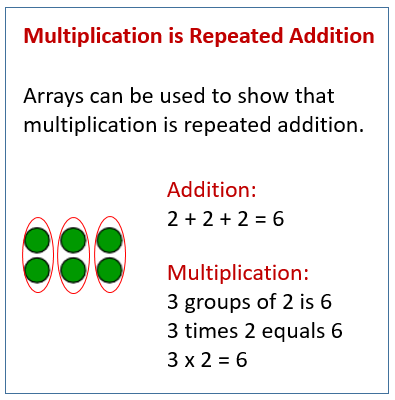 How to use arrays to model repeated addition and multiplication? What are arrays and how do they show multiplication? Commutative Property - You can multiply numbers in any order and the product will be the same. How to add items in an array?